One of the biggest challenges for CCTV installers and system designers is the massive amount of time and detailed knowledge required. Edraw CCTV Network Software makes the process quick and simple. It helps finding optimal positions for video surveillance cameras. CCTV Design Tool empowers you to save time and money and to design video surveillance system more professionally. Discover why Edraw is an awesome CCTV network maker: Download it Now. 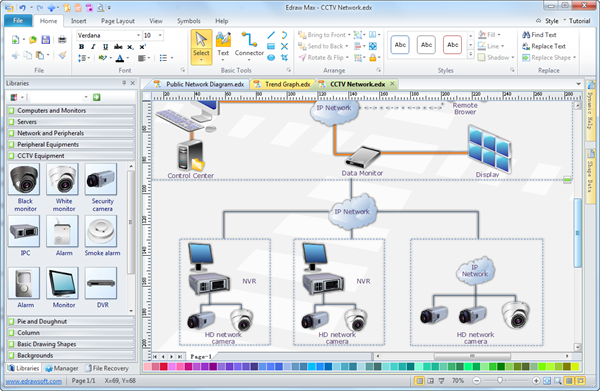 Edraw CCTV Network software is used to help visually present security camera wiring diagram, network security systems, surveillance camera wiring diagram, CCTV wiring diagram and schematic diagram CCTV system. For those already accustomed with other Microsoft apps such as Word or Excel, the interface will be very familiar. Simply drag and drop symbols, apply built-in design themes, and automatically share your finished CCTV network into a presentation or PDF with one click . We believe that it is really a strong software whose use is indispensable for all those technicians who daily work in CCTV field. We can ensure seamless compatibility with MS Office and optimal performance in the operations. This one-stop solution eliminates the necessity to deal with multiple vendors when any support is needed. One graphic, wide share, infinite benefits.